The BFI London Film Festival begins tomorrow, opening with Tom Hanks vehicle 'Captain Phillips', and with over two hundred feature films on offer, we're kicking off with some bite-size reviews. 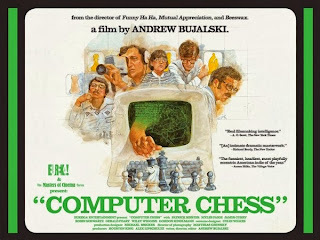 Tonight we take on retro-mockumentary 'Computer Chess', sociological study 'Gare Du Nord', and indie romantic drama 'The Spectacular Now''. If you're yet to buy tickets to any of the festival's vast selection, please do also have a gander at our LFF 2013 preview. Setting your comedy in the world of 1980s computer programming and framing it in black-and-white mockumentary style takes some chutzpah. 'Computer Chess' pits teams of programmers against one another in the quest to discover whether it is indeed possible to beat a human being at chess using a computer. Events develop in an unpredictable fashion, especially when the computing world collides with a self-help workshop weekend that happens to take place in the same hotel. This mysterious docudrama set in the iconic Parisian train station is a classy piece of observant filmmaking. We dip into the story of Ismael (Reda Kateb), a postgrad researching Gare du Nord for his thesis. He strikes up a reluctant relationship with an ageing professor, Mathilde (Nicole Garcia), where they edge towards their own romance while watching lives intersect on platforms. Best Drama at Sundance 2013 and film critics fawning over it, 'The Spectacular Now' is truly a misnomer of the hype machine. The second big venture from the writer of the bittersweet rom-com '500 Days of Summer', we follow the story of quasi-frat-bro Sutter (Miles Teller), a hip-flask swigging high-school senior who has just broken up with his perfect girlfriend. After a heavy night out in the aftermath, Sutter meets the quirky and unconventional Aimee (Shailene Woodley). Aimee falls in love and begins to de-douchify Sutter, offering a new perspective on life. Under Aimee’s encouragement, Sutter goes on the trail of finding out more about his absent father.